In this webpage, I examine the origins of the Gwinn family that lived on the Great River of the Calfpasture, Augusta County, Virginia in the mid-1700s. For convenience, I will use the spelling Gwinn to represent all of the variations in the spelling of the name unless otherwise noted. Two brothers, Samuel and David Gwinn left Ireland together, were shipwrecked and Samuel drowned. David was picked up by a sailing vessel and brought to America. He married an English woman, settled in Augusta County, Virginia and reared a large family. Two of David’s sons, James and Samuel came to the vicinity of Lowell, West Virginia from [the] Calf Pasture River, Virginia, about the year 1780. The statement above appears in an undated one-page manuscript typed by my grandfather, Basil Gwinn, probably around 1970. In the manuscript, he credits his source as the records of Wade Gwinn of Green Sulphur Springs, West Virginia. There are at least two errors in this version of the family tradition. It names the two brothers on the voyage as David and Samuel, with Samuel drowning before reaching Virginia. It also states that David is the founding father in Augusta County; with James and Samuel as his sons. However, the first Gwinn settler on the Calfpasture River, was Robert Gwin, Sr. who was the father of David, Joseph, Robert, James and Samuel. Despite these errors, the family tradition does clearly point to Ireland as the place of origin and Augusta County as the destination of the Gwinn family. Also, the story of a shipwreck, or at least a very bad storm, is an enduring legend in the Gwinn family and may have a basis in historical fact--more on this below. "Samuel and James Guinn, two brothers, settled and made their home near that of Graham. Before the Lowell settlement the Grahams and Guinns were neighbors on the Calf Pasture River and had even both sailed over the blue waters from Ireland." Mr. Graham's history is compelling, primarily because David Graham personally knew the Gwinn family and stated he remembered Samuel Gwinn, Sr. as an old man when Graham was a boy. Consistent with the Gwinn family tradition, he states that both families came from Ireland. He doesn't say it explicitly, but he implies that the two families may have been neighbors in Ireland and may have sailed to America together. There is further evidence for this in another source; the History of Rockbridge County by Oren F. Morton, says that "John Graham and his family experienced a great storm during their voyage from Ulster" again echoing the Gwinn family legend. The History of Summers County from the Earliest Settlement to the Present Time, by James H. Miller, was published in 1908. Miller states that "Samuel Gwinn, Sr. was the first person of that name to settle in this county, and the evidence seems to show that he, with the Gwinns and Grahams, came together from the same section in Ireland to this country, and first located in the same neighborhood, on the Calf Pasture River in Virginia ...." Miller concludes that "the Gwinn ancestor was evidently Irish." "The Gwin Family is of ancient Welsh origin and the name in Welsh means “white” or “candid” … Robert Gwin, the progenitor of this branch of the Gwin Family came to Virginia before 1744. He was born in Orange County, Wales." This is the first known published reference to a Welsh origin for the family. Cleek correctly identifies Robert Gwin as the progenitor of the family and correctly places him in Virginia before 1744. However, there are two errors in the above quote. The first is minor; the word gwyn is Welsh for "white" but does not mean "candid." The second mistake is both obvious and more serious; there is no such place as Orange County, Wales. It is possible that Cleek meant to say that Robert was born in Wales and came to Orange County, Virginia. Augusta County was organized out of Orange County in 1738. "Robert Gwinn and his family from Orange County, Wales came to America, settling in North Carolina sometime early in 1700 or at least sometime before 1745." Here, Jesse Blaine Gwin repeats and expands on the mistake of Cleek. This time it is Robert Gwin and his family coming from Orange County, Wales. But as an added element, Robert comes to Virginia only after first settling in North Carolina in the early 1700s or before 1745. However, Mr. Gwin provides no documentation or reference for these statements. In general, the History of Gwin Family is a compilation of various material greatly varying in accuracy and reliability. However, on page 65 of the History there is an interesting memoir from 1907, published for the first time in 1961, entitled the Sketch of the Gwinn Generation. The Sketch of the Gwinn Generation was written around 1907 by Addison R. Gwinn at the request of J. C. Gwinn, son of August Gwinn. The Sketch is partially based on an oral history of the Gwinn family as reported to Addison R. Gwinn in 1848 by Mrs. Isabella Gwin Hogshead, daughter of Captain David Gwin, and the grand-daughter of Robert Gwin, Sr. Mrs. Hogshead was over 80 years old. The Sketch is a valuable document although there are some concerns due to the fact that Mrs. Hogshead's recounting was not written down by Addison Gwinn until 59 years later. It is sometimes difficult to tell in the Sketch what is Mrs. Hogshead's remembrances and what information is added by Addison Gwinn. Because of this, it is also difficult to tell whether the factual errors in the Sketch are due to Mrs. Hogshead's faulty memory at the age of 80 or Addison Gwinn's hazy recollection after a passage of 59 years. I am inclined to believe that it was the latter and that any mistakes in Mrs. Hogshead's tale are due to the passage of time before it was written down. The main problem with the Sketch is that it says that Samuel and James Gwinn were the sons of Captain David Gwinn. That would make them Mrs. Hogshead's brothers; but later in the Sketch, James is referred to as Uncle Jimmy. What I believe happened is that Mrs. Hogshead told Addison Gwinn that Samuel and James were her uncles, but Addison Gwinn in 1907 mistakenly says that Samuel and James are Mrs. Hogshead's brothers. This is the only way that the Sketch makes any sense. The Sketch appears to be the original source material for the manuscript written down by my grandfather and may have been among the records belonging to Wade Gwinn of Green Sulphur Springs. It recounts the tale of two Scotch-Irish brothers, Samuel and David, who leave Ireland for America with Samuel drowning. It is speculation, but what if Addison Gwinn made a mistake here as well. What if Mrs. Hogshead recounted the tale of two brothers, Robert and David, or Robert and Samuel, who came to America from Ireland with David/Samuel drowning on the voyage. The survivor, Robert, settles in the Valley of Virginia, and has several sons among whom are David and Samuel. This interpretation reconciles the traditional story with the historical record relating to the arrival of Robert Gwin in Augusta County, Virginia. Robert Gwin, Sr. makes his first known historical appearance in a land transaction in Augusta County, Virginia. At a court held for Orange County on Thursday, July 20, 1745, an indenture was acknowledged and ordered to be recorded between James Patton and John Lewis of Beverly Manor, Augusta County and Robert Gwin of the Calf Pasture, Augusta County. The indenture was for the sale of 544 acres on the Great Calf Pasture River to Robert Gwin for five shillings. The indenture was signed by Patton and Lewis and sealed and delivered before witnesses David Kinkead, Robert Bratton and Loftis Pulliam on July 16, 1745. This transaction was not an isolated business deal. On the same day, July 16, 1745, Patton and Lewis also sold tracts on the Great Calfpasture to Robert Bratton, John Dunlap, Loftis Pulliam, John Wilson, John Kinkead, and John Miller. These purchases, as well as others which took place in the spring and summer of 1738, were part of a joint venture between Patton, Lewis and William Beverley to obtain title to 30,000 acres of land on the Virginia frontier. To understand the significance of these transactions, we must look back at how the land came into the hands of Lewis, Beverley and Patton. On May 5, 1737, the Council of Virginia granted to Edward Barradall, Esq., and John Lewis, Gent., 30,000 acres of uncultivated land in Orange County lying west of the land of William Beverley including a "certain place called the Calf Pasture" upon condition of settling one family for each 1,000 acres within two years. This is probably the Edward Barradall who was mayor of Williamsburg in 1736 and 1737 and who died around 1743. Captain James Patton first became involved in the venture in August 1737. In that month, William Beverley wrote to Patton about the 30,000 acres and said he was "willing you should hold one quarter part of it being at 1/4 pt of all ye charges & doing your upmost endeavor to procure families to come in and settle it." In another letter, Beverley said "I should be very glad if you could import families enough to take the whole off our hands at a reasonable price and though the order [from the Council of Virginia] mentions families from Pensilvania, yet families from Ireland will do as well." Beverley and Lewis needed an experienced sea captain with business connections on both sides of the Atlantic to pull off the deal. At that time, Patton was working for a prosperous Irish Presbyterian merchant by the name of Walter Lutwidge. Based out of Whitehaven, England, and trading in tobacco from Maryland and Virginia, Lutwidge owned several ships including the Cockermouth and the Walpoole. Using Lutwidge's ships and resources for his own purposes, Patton planned to abandon his life as a sea captain and make his fortune in Virginia. The Ship Cockermouth of Whitehaven, Burthen 250 Tons, newly rebuilt, and well fitted, manned and victualed, mounted with great Guns, and a sufficient Quantity of small Arms, Captain James Patton Commander, will be in Dublin the latter end of April, or Beginning of May in order to take in Passengers for Virginia, Maryland, or Pennsylvania: (those for Pennsylvania to be landed at the Head of Chessypeak Bay, either at Bohemia Landing or Elk River.) Whoever is inclined to go in the said Ship from Dublin, may apply to Mr. Matthew Houghton, Mr. John Hornby, Mr. Campbell Merchants there, or to the said Captain at Mr. Heath’s at the Flag on Temple Bar, or on the Custom House Key, and on the Change at Change House, who will article with them. The said ship, when victualled and fitted, will sail directly from Dublin to Loughswilly in the County of Donnegal. Whoever is inclined to go with her from thence as Passengers, to any of the aforesaid Places, may apply to Mr. Collin Campbell, Mr. John Preston in Derry, Mr. Daniel M’Farland near Burn Cranoughy, to Mr. John Hutchinson of Glenvain, to Mr. Robert Smith of Rathmullen, and to Mr. David Thompson of Rathmalton. Those from Limerick must apply to Mr. Isaac Patton, or to Mr. Charles Linde at Coleraine, and at Monaghan to Mr. William Jeeb. Those from the Counties of Tyrone and Armagh may apply to Messrs. James and Thomas Sommervill in Dungannon, who goes with the Ship with their Families. All the aforesaid Gentlemen will enter into Articles with passengers according to Custom; The Ship being five foot one half between Decks, which is very commodious for Passengers, and may assure themselves not to be crowded, but in all respects civilly used. By the time the advertisement was published, the Walpoole had been substituted for the Cockermouth (which appears to have run aground with a load of goods) and was in or on its way to Dublin. Patton sailed from Whitehaven, England in Walter Lutwidge's ship Walpoole on March 16, 1737/8. The ship lay some weeks at Dublin, taking on passengers and indentured servants. One of those indentured servants was Peter Burke who signed an indenture paper with Patton in Dublin on April 28, 1738. Sometime after April 28, the Walpoole set sail for Lough Swilly on the northern coast. Meanwhile, John Preston, Patton's brother-in-law and agent in Derry was signing up passengers to go as settlers to Virginia. It is probably here in the heartland of the Patton and Preston families that most of the emigrants came on board. Although a passenger list does not exist, it is very likely that one of those on board may have been Robert Gwin. As yet, I have been unable to determine when the Walpoole left Lough Swilly and from what port. Sometime in late May or June 1738 would be a good guess. There are several ports that could be candidates including Buncrana, Rathmullen or Rathmalton. The Walpoole arrived in Virginia sometime between August 23-26, 1738. Peter Burke's indenture papers has a notation that the ship arrived on August 23, 1738. This may have been the date that the ship entered into the Chesapeake Bay. An article in the Augusta Historical Bulletin states that the Walpoole was entered into the records of the Custom House at Belle Haven (present day Alexandria, Virginia) on August 25, 1738. According to other sources, the shipping returns for the South Potomac and Accomack District record that the ship Walpole, James Patton, Master, arrived in Virginia on August 26, 1738. Although the official records point to Belle Haven as the first landing site, this may not be the case. Some published recollections of Patton descendants state that the Walpoole landed at Hobbe's Hole, current day Tappahannock, Virginia on the Rappahannock River. What is certain is that the passage was not all smooth sailing. Late August would have been hurricane season along the American coast. Like the Grahams, the Preston family later recounted a great storm that washed their possessions overboard and left them nearly empty-handed when they arrived in America. This "great storm" or hurricane during the voyage of the Walpoole may be the genesis of the Gwinn shipwreck story. Whether the new settlers arrived at Belle Haven or Hobbe's Hole, they must have soon moved on towards their final destination: the Calfpasture tract. The settlers may have spent the winter of 1738-39 on the Beverley estate but probably not at the expense of Beverley or Patton. Instead, Patton appears to have supported the settlers with William Lutwidge's credit. By September 1739, Lutwidge began to realize what had happened after going over Patton's accounts. When the Walpoole returned to Whitehaven in October 1739, Lutwidge replaced Patton with another captain. "I must own that I have met with both knaves and fools in plenty, but of all ye Knaves I ever met, Patton has outdone them all. James Concannon can tell you of his viloney which I dare not repeat; he charged no less than 6,000 lbs of fresh Beefe in Virginia, 40 barrels Indian corn and everything else in proportion, took 15 servants to himself at a clap. In short, Hell itself can't outdo him." On April 27, 1742, the Council of Virginia recognized that James Patton, a partner in the venture, had "at his great expense transported Several Families from the North of Ireland in Order to Comply with the Condition of the said Order." The Council noted that 36 families were transported and settled on the lands. In 1744 a plat of the Calfpasture Settlement (shown left) was made for Colonel James Patton. A 544 acre piece of land, lot #16, is designated for Robert Gwin. The original map is part of the Lyman Draper collection of the Wisconsin Historical Society. 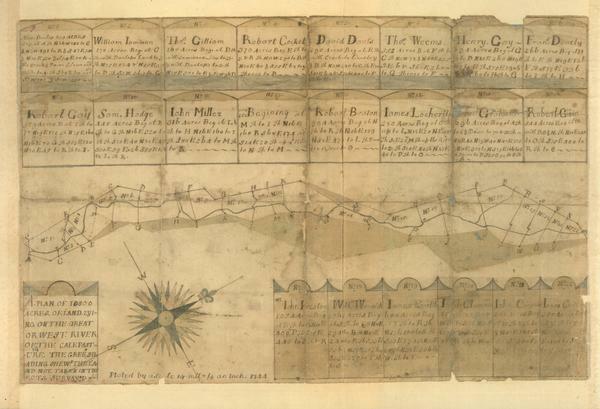 In 1745, seven years after the arrival of the Walpoole in Virginia, Patton along with Lewis and Beverley sell the Calfpasture tracts to the settlers. It is worth noting that the contract of indenture of Peter Burke was for a period of seven years beginning on the date of his arrival in Virginia, August 23, 1738. The other settlers may have also had a seven-year contract. DNA Results: The Key to the Puzzle? After years of genealogical research, I found that the historical record could only take me so far. In the spring of 2008, I had reached the point where I was ready to test my Y-chromosome DNA sequence through one of the established genealogical testing services. Since the Y-chromosome is only passed through the male line from father to son, it is a valuable tool for genealogical research because surnames are also passed (usually) from the paternal line. For those not familiar with Y-DNA testing, I will give a simplistic explanation of how it is used in genealogy. Geneticists have identified specific locations or loci on the Y-chromosome. These specific locations have been given identifiable names expressed as DNA Y-chromosome sequence (DYS) numbers. At each of these locations, there are repeating sequences of nucleotides. These repeating sequences are expressed as allele values. These allele values generally vary from person to person, but rarely vary among closely related persons due to a slow mutation rate. To better illustrate the above explanation, here are the results of my 12-marker test. Typically, most genealogical DNA services offer tests to measure anywhere from 12 markers up to 67 markers. The 12 marker tests generally paint a broad picture of human genetics. The resulting combination of alleles, called a haplotype, is grouped by geneticists with similar haplotypes into specific genetic haplogroups. Currently, these haplogroups are labeled A through T and define the entirety of humanity. Most Western or Atlantic Europeans and their descendents fall within a subgroup of haplogroup R called R1b. R1b is particularly high in Wales where it is estimated to reach 89% of the population. So, initially believing my ancestry to be Welsh, I was not surprised when my results arrived and confirmed that my haplotype belonged to haplogroup R1b. However, my results went far beyond what I expected; my specific markers were an exact match with the North West Irish Modal Haplotype. Further tests confirmed this when they came back positive for the M222 single nucleotide polymorphism (i.e., mutation) which defines the NW Irish Modal Haplotype. Researchers from Trinity College Dublin associated +M222 with the Ui Neill dynasties, descendants of Niall of the Nine Hostages, when they noticed that men with traditional Ui Neill surnames matched this haplotype subgroup. As indicated in the map below right, the largest percentage of men in Ireland with this DNA signature hail from an area extending south from the base of the Inishowen peninsula; an area in the vicinity of Lough Swilly and from which many of the families on the Walpoole voyage would be expected to come from. Above: Map of Eurasia showing human migration as represented by haplogroup. Right: A graphical depiction of the percentage of Irish males with the +M222 mutation. The highest percentages are localized in an oval area south of the Inishowen peninsula which includes Counties Donegal, Tyrone, and Derry. aliases adopted for various reasons. To determine if there was a non-paternal event along my line, I needed to find other descendants of my ancestors who had taken the Y-DNA test. And for my purposes, the farthest back the common ancestor the better. Fortunately, I did have two distant cousins who had tested their Y-DNA. Cousin #1 is a descendant of Samuel Gwinn Sr., the pioneer (1751c-1839) through his son, Samuel Jr. Since I am descended from "Squire John", son of Samuel Sr., a match on our results would eliminate the possibility of a non-paternal event on either line up to Samuel. Cousin #2 is more closely related to me. Like me, he is also a descendant of "Squire" John Gwinn (1789-1873) but through his son Breckinridge. I am descended from Breckinridge's brother Samuel Lake Gwinn (1824-1899). A match of our results would eliminate the possibility of a non-paternal event on either line up to "Squire John." As it turned out our 12-marker haplotypes matched almost perfectly and eliminated the possibility of a non-paternal event in any of our lines from Samuel Gwinn Sr. I did have a single deviation at DYS#391 where I had 11 repeating sequences instead of 12. Somewhere between "Squire John" and me, my line had a mutation losing a sequence at this locus. The above results also allow for a supposition on the probable 12-marker Y-DNA sequence for Samuel Gwinn, Sr., the pioneer. The Y-DNA test results of three separate descendents of Samuel Gwinn, Sr. (1751c-1839) match the NW Irish Modal Haplotype and point to an Irish origin for my Gwinn family. Does this mean that the family cannot be Welsh in any sense? Probably. M222 occurs very rarely in Wales; and then among those with Irish ancestry. However, there are a couple of scenarios that would explain how a Welsh family acquired a Y-DNA signature that is distinctly Irish. I do not believe that either origin theory is the most likely, but they cannot be ruled out. First Scenario: A non-paternal event among the ancestors of Samuel Gwinn could account for the Y-DNA results. In this scenario, a Gwyn family from Wales would have immigrated to Ireland probably in the 1600s. During the period in Ireland, some type of non-paternal event affected the Y-DNA signature. Second Scenario: Following the withdrawal of the Roman Legions from Britain in the 5th century, A. D., the Irish raided into Wales and in some cases attempted the establishment of a permanent Irish colony. These Irish colonies ultimately failed, but they could have left a genetic signature in Wales. Additional Y-DNA testing in Wales may test this theory over time. Interestingly, at least one arms bearing Gwyn family in Wales claimed Irish descent. As late as the 19th century, the Gwyns of Breconshire claimed descent from a 5th century Welsh king, Brychan Brycheiniog. Brychan was born in Ireland, the son of an Irish prince named Anlach and his wife, Marchel, heiress of the Welsh kingdom of Garthmadrun which later became known as Brycheiniog (Brecknock in English). The specific ancestry of Prince Anlach is unknown. Claiming descent from Brychan, the Gwyns of Breconshire adopted the attributed arms of Brychan shown at right. You will often see these arms advertised by various companies as a coat-of-arms for all Gwinn families which they are definitely not. The M222 mutation probably did not originate with Niall, but it was likely propagated through his line by positive social selection. Powerful men, especially kings, were more likely to have many offspring. Therefore, if the researchers of Trinity College are correct, all of his direct male line descendants are +M222. But could the Gwinns actually be descended from Niall? There may be a simple answer to the Gwinn family origin in the traditional Irish genealogies. Niall is said to have had as many as eight sons, although some may have been later additions by medieval families trying to tie their ancestor to the dynasty of the famous High King. Among his historically documented sons was Prince Eoghan (pronounced Owen) who was the founder of the Cenel Eoghain ("the kindred of Eoghan") dynasty. It was Prince Eoghan who established the Kingdom of Ailech, later the Kingdom of Tir-Eoghain (modern county Tyrone). One of Eoghan's sons, Fergus founded the Clann Feargusa which included the O'Cuinns and the O'Hagans. The O'Cuinns are descended from Fergus' grandson, Coinne. O'Cuinn means "descendant of Conn or Coinne" and later became anglicized as Quinn; a name which could have easily mutated to Guin, Gwin and Gwinn. Even the early Augusta County records use Quin(n) and Guin(n) almost interchangeably. The chief of the O'Cuinns became the hereditary quartermaster of the army of the O'Neill. Along with their kinsman the O'Hagans, the O'Cuinns formed the vanguard of the army of the O'Neill. In that role, the family would have served the last ruling O'Neill, Aodh Mór Ó Néill (Hugh the Great O'Neill, 2nd Earl of Tyrone) in the Nine Years War a/k/a Tyrone's Rebellion (1594-1603) against the English. Following the collapse of Tyrone's Rebellion, Hugh and his ally, Rory Ó Donnell, 1st Earl of Tyrconnell, sought and received terms from the English government. However, just a few years later, fearing arrest and imprisonment, they sailed into exile leaving from Lough Swilly on September 14, 1607, an event known in Irish history as the Flight of the Earls. The resulting power vacuum forever ended the rule of the native Gaelic princes. At that point, the O'Cuinns, or Quinns as they became increasingly known, would be forced to make a choice whether or not to assimilate or hold themselves separate from the new ruling order. Accordingly, some of the Quinns in Ulster converted from Catholicism to the Presbyterian faith of their new neighbors. It is quite possible that, in this context, 131 years after the Flight of the Earls, another exile would also leave on a ship from Lough Swilly never to see Ulster again, a young Irish Presbyterian named Robert Gwin. Occam's Razor is as applicable in genealogy as it is in science; when all theories are otherwise equal, the simplest explanation is usually the correct one. The history of the Calfpasture settlement, and the Gwinn family traditions, point to Ireland as the place of origin of Robert Gwin of the Calfpasture. When combined with the unambiguous Y-DNA results of his descendants, which indicate an even older presence in Northern Ireland, it appears most likely that the Gwinns and their paternal ancestors had always been in Ireland. In short, our Gwinns are ethnically Irish, not Welsh. Admittedly, a descent from the O'Cuinns is only one possible explanation of the origin of the Gwinn family surname. Additional DNA testing, including males from Ireland, will be needed to provide further data that will either confirm or refute the theory that the Gwinns of the Calfpasture are descended from the O'Cuinns of the Cenel Eoghain. Photo Credits: Old Iskaheen graveyard and church ruins and burial marker of Eoghan, Prince of Inishowen, by Radoslaw Botev. A view of Lough Swilly - perhaps for Robert Gwin Sr., the last view of his former home.